It happened again. Your design was perfect. You connected with your users, identified some major pain points they needed solved, ideated through multiple solutions, and even included dev to make sure to account for any technical constraints. Then your world comes crashing down when the executive swoop and poop begins. The CEO wants you release it quicker. The Product Owner wants an “MVP” release first that you know is a neutered version that only minimally addresses any user needs. The CTO has some architecture concerns. The Head of Sales wants features X, Y, and Z that will make it easier for his sales team (and many of which have already been promised to prospects), etc. The result? A watered-down version is released that is “safe”. No risks were taken, and only very minimal improvements were made to the user experience. You go out to lunch with another designer and bemoan those “business” leaders who don’t understand design who ruined everything. They did not ruin your perfect design, though… you did. You did not understand business. You didn’t have the background necessary to get your design out the door. Design is being valued in organizations like never before. Designers are being brought in earlier to startups and being involved at higher levels in big corporations. More and more companies are promoting VPs of UX, Chief Design Officers, and Chief Experience Officers. I’ve even heard more than once of large clients demanding that companies looking to earn their business start UX departments. As an industry we are finally getting the recognition and leadership opportunities for which we have been clamoring for decades. The problem? We’re not ready. The vast majority of designers today do not think in terms of business priorities or seek to develop leadership skills. Many of those VP of UX roles are being filled by those with product management or engineering backgrounds. When we do see designers in leadership roles, far too often they were promoted because they were the most talented designer/individual contributor rather than because they demonstrated business & leadership expertise. This needs to change. Like anything, leadership and business skills need to be taught. The skills required for leadership require different mental muscles. They need to be developed, and it doesn’t happen overnight. If you are not already actively working to acquire/develop leadership skills, start now. Discuss it with your boss on your next one-on-one. Ask for feedback. Read books. Do whatever you can to develop a plan to become a better leader. Opportunity will come knocking if you do. If you are prepared, when you get that seat at the strategy table you will be able to improve your customers’ experience more than you ever could as an individual contributor. As a designer, you have the best skillset of all to make a difference at the high levels. Business strategy, processes, and team organizations need to be designed. Isn’t that what Design Thinking has been telling us for years? Who better to help facilitate that than those who have been employing design methodologies for YEARS? You will be uniquely suited to help guide the direction of whole organizations, but only if you prepare. Only if you are ready when the time comes. Until we have designers involved in top strategy discussions, users and their jobs to be done will be far under-represented, and decisions will continue to be made based on hunches. Safe, incremental improvement with very little risk will be the name of the game. To be invited to the table as a respected peer, however, we need to be able to speak the language of business. We need to understand how the products we design with so much passion improve the business. We need to start selling trust and confidence to the executive team. They need to know we have their back and are working with them not against them. 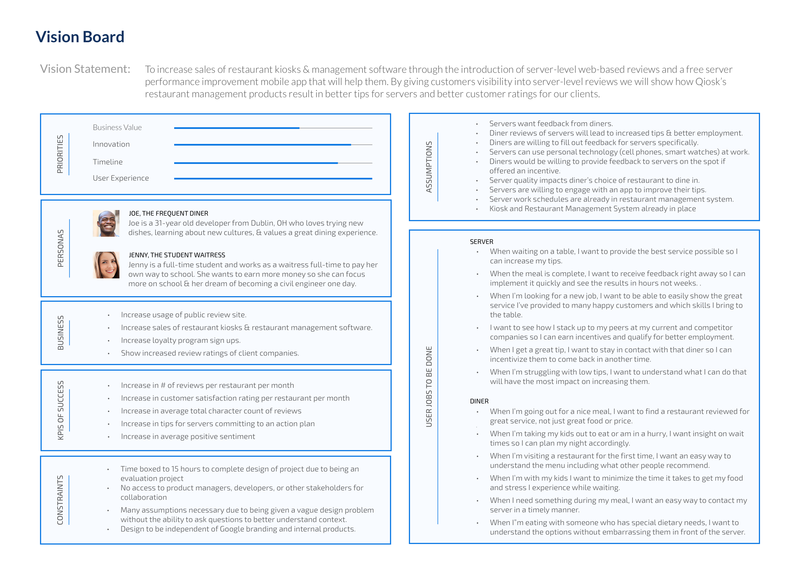 It is my hope that this article can help provide some tips and suggestions to help anyone wanting to be more effective in transforming their products or organizations be more user-centered and deliver improved outcomes for their customers. Get innovative ideas out the door with minimal interference from management. Focus your innovation and eliminate waste. Effect the greatest change by having a seat at the strategy table. Gain the trust and freedom to experiment, fail, and learn. Increase the UX Maturity of your organization. Sounds good, right? Ok, then let’s dive into how you can make it happen. Understanding which business strategy is a priority for the business on each project you work on will better enable you to craft a user experience that supports that. It also helps you make trade-off calls, operate within tight deadlines, and pick your battles of when to really push back. In those cases when you do need to push back, it gives you a framework and way to talk about WHY you are pushing back, and how the company can benefit. Understanding business priorities is a great start, but is not always sufficient to get your ideas out the door. There are 3 main business skills you must develop if you want to get your best ideas out the door. You have to be able to sell your designs and research. Business is nothing more than a constant sales pitch. Those who do it best, get their ideas through. Understanding that simple truth can be transformative for designers. Many of us show our work to managers/executives with a “what do you think” attitude. This is born out of our desire to always be learning from our users. To avoid this, sell solutions (plural) to the executive team. Show them that you’ve thoroughly thought through the problem at hand. One great way to do this is to showcase at least 3 solutions to the problem. Even better, show that you’ve tested the 3 solutions and show them the data/quotes that have come from it. Better still, get anyone you need to “sell” to observe your user research sessions. When you are planning your selling approach, make sure to take your audience into account. What are the problems/opportunities from their point of view? How can your design help achieve THEIR goals? If they’re completely unaware of the problem at hand, demonstrate the problem before you talk about the solutions. Villanize the problem then show how your solution will defeat the villan. Storytelling is a fantastic approach for doing this. Think about the medium that resonates most with your audience. Maybe it’s power point, maybe it’s an interactive prototype, maybe it’s simply an edited video of your user research sessions. Maybe it’s data on a spreadsheet. Think about how detailed you need to be. Should you focus on the high level and use more story telling or do you need to dive into the nitty gritty? An executive typically wants to see just enough to know you understood the problem and have found a viable solution. Product, Dev, or Design leaders will likely want more detail. Finance will care about the numbers and ROI. Marketing will care about the story they can sell to consumers. Sales will want to know how this will help them achieve their quotas. There are SO MANY ways you can show value of any design project. You just need to understand your audience. When you are confident and sell your design, what you really are selling is trust. You start to become a partner — a subject-matter expert — rather than a grunt. When stakeholders understand that you are a detailed thinker, they will start to trust you. They will give you a little more freedom, then a little more. Another way to prove you are a partner not a “resource”, is to push back. Yes, I said push back. If an executive comes to you and says, we need to add a notes field here. Understand WHY. What kind of a notes field? What do we envision will go in the notes field? Is the need behind the request a symptom behind a greater usability problem? Will the notes values ever need to be parsed? Will multiple people be adding/editing the notes? Do we need a date/timestamp on each note, or is freeform ok? Is there any way this can be automated? Etc. Etc. Etc. Once you have thoroughly understood the problem, come up with alternate solutions. Get users and other stakeholders to weigh in. Then go back to the executive and present your options and findings. Even if the decision still is to just slap a free form notes field on there, you will have proven you are invested in solving the problem and have the capacity to think thoroughly about the needs of the company and users and they will respect you for it. Which brings us to “politics”. Many designers naturally view “politics” in a derogatory light. It’s something that happens in highly inefficient, user-adverse organizations. The truth of the matter is, however, that politics IS business. It’s negotiation and relationship building. As UXers we’re used to empathizing with our users, but we need to start empathizing and understanding our stakeholders. What does sales want from the product? Client Services? Marketing? The CEO? The board? Why does the CPO always swoop in and poop on your work? Start understanding and relating with people. Bring them in to your design process. Take them to lunch. Learn what motivates them. Do they feel threatened by you? Did they have a bad experience in the past? Do they not understand why you want to talk with “their” customers? Etc. Build relationships and get to know your co-workers and those in client organizations and you will be amazed at how many doors start to open up. The product manager on my product did not want to allow time for user research. He viewed himself as the “mini-CEO” and just wanted to “own” all the decisions and didn’t want to be slowed down. The Client Advisor team owned the relationships with the customers and they were very opposed to letting designers talk to “their” customers. I started out small. I did a little benchmark testing with a fast food chain store manager I knew personally and got a little data of major problems with the current UI we were about to develop. Then I found a couple examples of similar design patterns similar to the designs I wanted to use in use by “big name” companies. I also estimated the cost (in dollars and cents) of building the wrong thing and having to come back a rebuild, or delaying for a week so I could have time to test further with more users (this time on the clock). It ended being enough for them to give me a shot. (Especially since I included a couple levels of this product manager’s reporting chain in the presentation of the findings.) As I remember, it was a couple hundred thousand dollars in savings. As the weeks went by, I really needed to solve problem #2 but wasn’t having a ton of success. Due to my manager intervening, I was able to get a few appointments with users scheduled but the tension with the Client Advisor team was really slowing me down. I decided to get to know the client advisor leaders first and then the individual team members over the accounts of the people I wanted to speak with. Not all of them were local, so it was a bit of a challenge but as I started to get to know them, I started to learn that there had been some difficult situations in the past with designers who had promised features to customers that never got implemented and it caused a lot of problems for the CA team. I explained my approach and assured them I wasn’t so short sighted and offered to have them join our research planning session. Together we came up with a plan (including exactly what we were going to show and which questions we would ask). The CA director also agreed to sit in on the calls with us, introduce us, and “keep an eye” on us. After the first session or two that trust was established and that roadblock was pretty much obliterated. Now when you talk about previous experiences, it tends to seem like it happened in the course of a few days and the problem was solved. Of course that wasn’t the case. It took weeks and a ton of hard, frustrating work. But my point is that if you are willing to do the work to empathize with your stakeholders, you often will discover ways you can find common ground to help bring them into your process and make them a collaborator instead of an adversary. I also want to just say a word about a concept called “political capital”. Sometimes, as in the example above, you have sufficient influence to effect organizational change yourself. Often, though, you don’t have enough influence or “political capital” and you need to recruit someone with more political capital to help evangelize your cause. There are a couple reasons you might not have enough political capital. First and maybe most obvious, the decision may just be above your pay grade or you are being blocked by someone with a higher position and no amount of empathy is helping. In these situations, it is important to recruit help. Find someone sympathetic to your cause and sell them on what you are trying to do first. This could be organizational change, or it could just be some design solution you feel particularly passionate about. Once they are sold on the problem you are trying to solve, they can help you sell your solution or convince the proper people it’s a problem worth solving. The more influencers you can find, the more effective you will be. One pro-tip here: most of us would naturally go to our immediate boss here. Yet in many situations that might not be the best course of action or your boss might not have the political capital to effect the change either. I once made this exact mistake and it was only when I showed the CEO what I was trying to do that I was unblocked. (Most problems get unblocked pretty quickly when the CEO believes in them). While I probably wouldn’t start with the CEO as the go-to influencer, sometimes it’s necessary. If I had recognized sooner that my boss didn’t have the political capital to help me, I could have had a major stumbling block blasted to oblivion more than a year sooner. So give some thought to who would be in the best place to help you. Another reason you might not have sufficient political capital is if you’ve spent it already. I have also observed and experienced this one personally. You have to pick your fights and you have to realize that organizational change takes time. Outline a roadmap complete with milestones of what success looks like. Maybe you just need to focus on a smaller piece at first then make incremental progress. Or maybe there are more important fish to fry and this frustration can wait a while. You definitely don’t want to be the person always saying no or trying to change everything at once. We have a word for those people: assholes. Political capital is just like cash currency, once you spend it, it’s gone. You might be able to borrow a little, but if you’re never paying back political capital lent to you, you’ll go bankrupt. I have seen leaders go politically bankrupt. Their effectiveness is brought to a screeching halt and it can even spell the end of their time at the company (either because they are let go, or because they become so ineffective they have no choice but to find another job elsewhere). Spend political capital wisely, and don’t forget to repay kindnesses shown to you, by helping others push forward their initiatives as well. Some might view this as political posturing, but I just call it empathy and human decency. We often think of negotiation in monetary terms, but it applies just as much to negotiating deadlines, autonomy, road maps, new hires, autonomy and many other things designers care about. Are you dissatisfied by something in your work conditions? Negotiate. The great thing about negotiation is it’s the opposite of complaining. To negotiate, you have to make a counter-proposal and illustrate (usually with data) why that is a better solution. The more you develop negotiation skills, the more you are able to do something about processes, behaviors, and policies you don’t like. Negotiation takes most people out of their comfort zone. This is why the most candidates do not both negotiating their salary after receiving a job offer even though the vast majority of employers are open to and even expect it. Another way to put it is you are nearly 6 times more likely to get your design out the door by learning how to negotiate than you are by creating stellar design assets alone. Of course, you have to have something to sell and you need firm negotiation ground to stand on, but if you don’t even try, you’re living far below your potential. If you want to be successful at getting your designs out the door, learn to negotiate. Q: How many UX Designers does it take to screw in a lightbulb? A: None. Why does it need to be a lightbulb? As designers we are trained to always push for innovation. This is as it should be. We are uniquely qualified. We never are satisfied with our work and always look to improve. Pushing beyond the bounds of the current or even the possible is at the core of innovation. However, there are also times when all we need to do is to “screw in the light bulb”. Not every project is innovative, and if you try to make it so you run out of both time and energy. Sometimes fixing a problem, meeting table stakes for a competitor or even fulfilling a client request takes priority because it will help enable future innovation. The goal is not to be mediocre it is to enable future progress. Without viewing each project through a business lens, such projects may seem like a flawed strategy and many designers bullheadedly push back causing unneeded frustration and waste in their projects. At the beginning of each project, I like to consider where that project falls along the continuum of Screwing in the Lightbulb vs. Questioning why it needs to be a lightbulb. I’ve found that establishing that early, helps guide design work, ideation, and trade-off decisions. Even more importantly, it eliminates wasteful debate standoffs between design, business, and technology. After a while of doing this, you start to hear people say things like: “we’re just screwing in the light bulb on this one” or “we need to invent a new light source on this one” (or somewhere in between). How does this help you ask? Say we’re working on a project and we run into a technological hurdle. If this is a “screwing in a lightbulb” project, it probably isn’t justified to spend the extra time on. If, however, we’re looking to push the envelope on this one, then that’s a much different conversation. Having a shared understanding across the team of the priorities is vital. If we are just screwing in the lightbulb it is important to understand why. Why did we agree to that client project? Is it going to fund our future innovation? Did they threaten to cancel? Is it being pushed by someone specific? Being able to have that conversation can also allow you to push back on the executive team and be looked on as a subject matter expert rather than just a production grunt. If you understand the business priority on each project you are less likely to run into difficult conversations in the first place. Business leaders will feel the need to step in less often because they will see that you’re focused on achieving what they want to achieve. Your goals are aligned so they can focus on other areas of the business and leave product design in your capable hands. Of all the frustrations I have heard from UXers, perhaps the greatest and most frequent lament is that executives “don’t understand design” or don’t “let me experiment/fail”. It’s the Swoop and Poop situation. Executives feel the need to come in and “save the product” by providing some gems of brilliant insight and then moving on to other areas of the business. They don’t take the time to understand where we’ve been, why we made the decisions that we made, and their decisions often are mandated as being final. You are ignoring the business priorities. The executive feels the need to “come save” the product so it will actually achieve the desired business outcome. You don’t have their trust. You didn’t communicate well enough or early enough. The executive is simply a micro-manager who can’t give control to anyone else. Understanding business can help you combat all three if these. Seek to understand the business priorities. Discuss them with the leadership team. Be a thought leader and communicate if you feel the project is going off-course or a different business priority should be the focus. Leaders respect those that push back as long as you have demonstrable data/reasons why. In those situations where you’re dealing with a micro-manager, use those politics/negotiation skills. First understand why they operate that way. Did they have a bad experience in the past? Are they stressed out? Do they lack confidence in you? Then call them out (respectfully of course). Negotiate with them. Help them understand that by swooping in all the time they are stifling innovation but that if they want to be involved more you would love to involve them in the creative process. I have observed even the most obsessed micro-managers let go when someone comes along they trust. So if you want things to change — earn their trust. Executives respect those that can break down barriers and if you want to be a design leader it’s a critical skill to master. Take ownership of the problem and design a solution just like you would a product. It can be difficult and is not an overnight process. If you work on developing this skill, you will be viewed as a vital partner and will be given the trust and confidence to experiment. As we all know, that is when true innovation happens. What do leaders like Jared M. Spool, Stephen Gates, Chris Risdon, Jeff Gothelf, Brad Frost, Joe Natoli and others have in common? They have transformed the UX Maturity of the companies they work for, and in many cases overcame decades-old traditions of inefficient design processes. How have they done it? By understanding business, and being willing to “run up the hill and get shot (not killed) but shot” as Stephen Gates frequently puts it. Change is hard, but if you understand business and what motivates those you work with, you can start to show the value of UX to the business. Start tracking all the client contacts anyone in product/UX has had each week and what the key learnings were from each one. These can be interviews, usability testing, support calls, anything. Track it over time and where possible map each learning to a business priority to highlight opportunities. Also it can be good to list the departments that participated (was it just UX or did anyone else observe). Formalize user research with a “user panel” or “customer advisory board” or something similar. Try to do it on the same day and time every week and invite business stakeholders, dev, support, sales or whoever you can get there to observe. Figure out ways to measure the user experience and report on those regularly. It’s important to include both qualitative and quantitative data. Prepare short audio or video clips of research that can be easily shared up and down the organization. Take the initiative and ask for forgiveness rather than permission. Want to implement design sprints? Just organize it and invite people, as opposed to asking for permission. Be a leader, not a follower. See an opportunity for solving a new Job To Be Done? Create a business case and present it to key executives. Better yet, if you have direct feedback from users to support it. There are so many opportunities for business-savvy UXers today. Companies are looking for leaders to take the bull by the horns and help take them to heights they never thought possible. As long-time facilitators of great collaborative design processes, we can be those leaders. If design is the rendering of intent, then develop the skills you need to start rendering your visionary intent. Stay motivated. Stay passionate. Be an agent of change. Take the bull by the horns by learning to speak the language of business.